Here's the NY Times' annual year-end quiz (printable PDF version here). It's really tough. Sadly, there are probably some people out there who know how many electoral votes each state has off the tops of their heads. Equally sadly, I am not among them. Answers are coming out tomorrow. I seem to recall hearing Al Franken on Air America shortly after the 2004 election. He was predicting that he would run for Senate in Minnesota in 2008 and that he would defeat Coleman and that Democrats would have a majority in both houses. Since the 111th Congress would take office about two weeks before the presidential inauguration, that would give them enough time to impeach Bush. And when asked why they were impeaching Bush, who'd be out of office in two weeks, Franken would reply, "Because we can." His goal was to remove Bush from office and get him back to drinking before inauguration day. It looks like Franken's fantasy is coming true. Think he'll follow through on his promises? 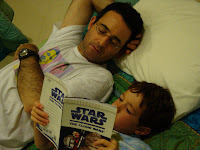 As the photo at left will attest, my son and I disagree about the entertainment value of the Star Wars: Clone Wars series. My son, of course, loves it. He's also a big fan of Phantom Menace and Attack of the Clones, and he finds Jar Jar entertaining, so I assume that there's something wrong with him. However, I was pleased to learn that even he has his limits. I stumbled across the complete Star Wars Holiday Special on Google Video recently, and he expressed interest in watching it. Even he complained that it was horrible after just ten minutes and refused to watch the rest. So I'm proud. But I post it here for my faithful readers and dare you to watch it. I'll bet you won't even make it to the dancing chessboard scene, no less the cameos by Bea Arthur and Harvey Korman. Still, the commercials are awesome. 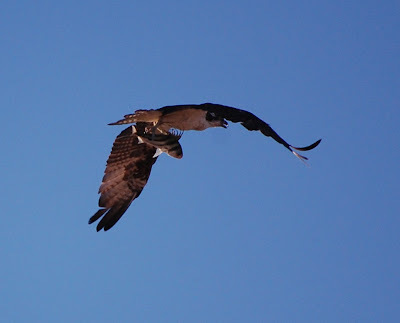 I just got back from a big family trip to Cabo San Lucas. This was never the kind of vacation I used to take, either as a kid or as a pre-fatherhood adult. But as a destination to travel to with parents and small kids, it happens to be quite nice. I went a week without doing any work at all. I actually read a novel. I (legally) smoked Cuban cigars and drank scotch. In a hot tub. I ate lots of Costco flan. I watched whales from the balcony of our condo. I hung out with my extended family and basically just relaxed. Anyway, sorry about the light posting in the last week, but as you can see, I was quite busy doing nothing. It's nice that's she's giving interviews now. But is she serious about this claim? Four congressional election cycles have transpired since 9/11, all without even a hint of a Caroline Kennedy candidacy. She might as well say that she was inspired to run for office because of her father's death, or the sinking of the Lusitania. Sorry, folks (especially Ari), for the light posting during the holidays. Family does have a way of consuming one's blogging time. At any rate, a quick thought that I've been stewing over since Obama's announcement last week that Pastor Rick Warren of Saddleback Church will offer the opening prayer at next month's inaugural ceremonies. As I recall, President Clinton made numerous outreaches to the conservative evangelical community during his presidency. He spoke at evangelical churches. He encouraged prayer in public schools. Many of these attempts, while no doubt political in nature, were, I believe, sincere. That is, Clinton is a commited Christian and believed that he had a common spiritual agenda with many of the religious right. What's more, these outreach attempts had costs within Clinton's own coalition. Many on the left (e.g. : supporters of abortion rights, defenders of secular public schools, etc.) were not comfortable with such efforts and felt just that much less enthusiastic about defending Clinton as a result. In the end, Clinton's efforts amounted to roughly nothing. If anything, the religious polarization of the nation only grew, with self-described evangelicals voting even more Republican. And it's not as though the conservative Christian community offered forgiveness or absolution during the impeachment. Meanwhile, Clinton gave some bipartisan legitimacy to ideas and individuals that had properly been considered conservative while disappointing his own supporters. I get the impression that Obama is going down that same route. I don't think it's smart politics to reach out to Pastor Warren, simply because it angers his own coalition members (notably including, but not limited to, gays and lesbians, whom Pastor Warren has compared to pedophiles) while begging the support of a community that will likely attack him ferociously throughout his first term and his reelection campaign. Perhaps he did it as a personal favor to Warren, who has extended some courtesies to Obama at key times in Obama's career. This is fine, but there are far less public ways for a president to return a favor. If you haven't used it, Data Desk is an awesome statistical program. It's very simple and rather limited (it doesn't do logit or probit, for example), but there are few better ways to simply play with a dataset. It's very easy to visualize data and to drag variables in and out of equations. I recommend it highly. Ten years for that? Come on. Okay, near as I can tell, Vanilla was out with some friends, armed with a 9mm, and they came across a party at which there were a bunch of coked up idiots who started shooting up the place. Now let me just suggest that if there are dope fiends spraying a party with gunfire, that's a problem, a problem which Vanilla didn't solve. So I don't know why he keeps promising to solve problems. That said, Vanilla was armed and could have done something really stupid like try to take out the bad guys. On top of that, there were scantily clad women at this party, a situation that can encourage risky behavior among straight men. But Vanilla didn't follow that path. He got the hell out of there and let the police deal with the problem. That's actually a really smart thing to do in this situation. So Vanilla may not be a real problem-solver, but he's not an idiot. Word to his mother. Could you hit the president with a loafer? Give it a shot. My best score so far is 11. The Colorado Democratic Party held a reception yesterday for the state's nine electors, who cast their vote for Barack Obama, and I got to speak with a few of the electors. The electors met at the governor's office, were sworn in by the state's chief justice, and then each cast their individual votes. The outgoing secretary of state (Mike Coffman, a Republican who just got elected to Congress), certified this vote with the lovely document you see at left. Each elector got a copy of the document, and the originals were sent to the U.S. Senate, which will certify the vote, and to the National Archives. I've been teaching about the electoral college for a lot of years, but I had to sit down and talk to some electors before I had a sense of what actually goes on. I was a bit disappointed that the entire college doesn't actually convene somewhere. I know they wouldn't actually deliberate, but it would be a nice nod to the intentions of the framers. Caroline Kennedy really wants to be appointed the next U.S. Senator from New York. As a lifelong Kennedy fan, let me cast a no vote here. I certainly have nothing against her. She seems very pleasant and intelligent, and from what I can glean of her political beliefs, they're very much in line with the mainstream Democratic views. But her primary political achievement is not dying horribly. Also, excellent breeding. That's just not enough for my tastes. I'd have no problem with her running for a House or Senate seat. If she wants to try the political arena, she's got the name recognition and money to start at a pretty high level. And she can see if she likes the gig and if voters respond to her. But appointing someone who has never run for anything or held any position of responsibility to high office strikes me as bad. That doesn't mean she wouldn't do the job well. (RFK was a pretty good attorney general, despite getting the job through shameless nepotism.) It's just symbolically bad. I really like the Obama narrative that a mixed-race kid who grew up in a fatherless home in Hawaii on food stamps could, through luck and pluck, get himself into Harvard, into the Senate, and into the White House. I know it's not really reflective of the level of social mobility of our society, but it's a good symbol to have out there. Anointing Caroline undermines that. This sounds like a good appointment to me. I was concerned about Ken's brother being nominated to Agriculture, but it looks like that's not happening. John's congressional district would, I think, probably go Republican in a special election. But a reasonably strong Democratic appointee to fill out Ken's Senate term could probably hold onto the seat in '10. Who should get that appointment? Personally, I'm hoping that state Sen. Ken Gordon gets appointed to secretary of state and that outgoing speaker Andrew Romanoff gets the U.S. Senate seat. I understand he's eager to get back to private life and even passed up an easy run for state senate this year, but he's also a skilled pol and it would be really hard to pass up an opportunity like this. One small problem -- Romanoff endorsed Hillary. But that might be water under the bridge at this point. Honestly, what kind of a man throws a shoe? From now on, all visitors to the president will be barefoot. Adding: The thrower had really good aim and a very short "reload" time, suggesting to me that this was not his first time throwing a shoe. Have you ever thrown a shoe? It's kind of hard to get a good grip unless you really know what you're doing. Also, Bush's reflexes were excellent. The electoral college "convenes" on Monday, and Obama electors are still being pressured to change their vote. It sounds like this pressure is coming from a few dozen people who are convinced that Obama isn't a native-born U.S. citizen. Still, I wonder how much of this sort of elector-targeted campaigning typically goes on after a presidential election. Hey, remember all those stories during the primaries and caucuses about Appalachia? Even in some midwestern states where Obama was doing quite well, he kept losing to Hillary in the Appalachian counties, etc. Well, check out this interesting little map from USA Today charting levels of corruption in state government. It suggests that there's a disproportionately higher rate of government officials being convicted in a lot of states following the Appalachian Trail. Also of interest is that Illinois doesn't stand out as particularly corrupt in this map. Perhaps because they have relatively few convictions. Still, it's surprising, given that, as John Stewart points out, you have a better chance of going to prison if you get elected Illinois' governor than if you kill someone. Two good things seem to be coming out the arrest of Illinois Governor Rod Blagojevich on charges that he was trying to sell Obama's old U.S. Senate seat. The first is that Obama apparently wouldn't play ball. Obama had a preference for a successor, but he wasn't willing to pony up money for it, which made Blagojevich mad. So Obama passes the (admitedly low) bar for being a clean Chicago pol. Regardless of whether you like Obama or not, it's probably to everyone's benefit that the incoming president doesn't have to take office with an enormous pay-to-play scandal wrapped around his neck. The second bonus is that we might get some real evidence on what a Senate seat is worth. Groseclose and Milyo did a nice study a few years back that took advantage of a change in campaign donation laws to figure out the price of a seat in the U.S. House. Members were allowed to keep the funds they'd raised for campaigning if they agreed to retire. Groseclose and Milyo found that the average member was willing to walk away from his House seat for about $3 million, although there was considerable variance on this figure. So maybe we'll find that Blagojevich received a lot of offers, and maybe even was willing to negotiate a bit. This could be quite informative. 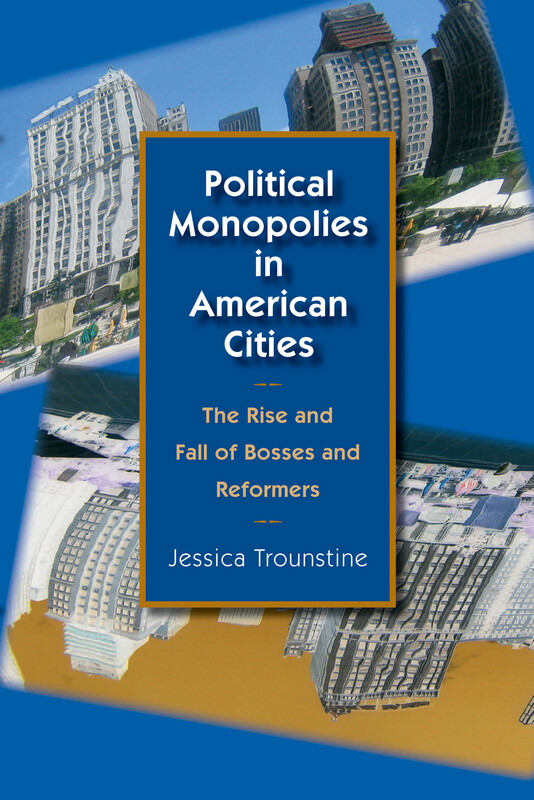 Jessica Trounstine's new book, Political Monopolies in American Cities (Chicago), makes a really nice contribution to the parties literature by helping to fill in this hole in our understanding. She compares classic machines like that of Richard Daley in Chicago with "reform" organizations that have run cities like San Jose and San Antonio. She shows that reform and machine politics are really just two sides of the same coin. Both are forms of political monopoly -- they control access to power in their cities and use tools of electoral bias (e.g. : the systematic disenfranchisement of groups of citizens potentially hostile to the regime) to perpetuate their rule. Reform coalitions are a bit different from classic machines, though. Reformers usually have the explicit support of the business community while machines are usually backed by working class groups; reform supporters are often of native white Protestant stock while machines are kept in office by a hodgepodge of ethnic and racial minorities, etc. But what these groups have in common is a similar life cycle. When they first come to power, it is usually by legitimate means, advocating for some segment of the population that feels underserved by the the government and winning over a majority of voters. Organizations often turn to anti-democratic tools to preserve their power once in office. (In an interesting finding, Trounstine shows that party machinery is more likely to emerge not when immigrants are flooding into a city, but when they stop doing so; the machine needs to limit challenges to its rule if it can't count on a steady immigrant vote.) That's when the monopoly organization starts channelling government benefits to just a few core groups and limiting the ability of other groups to participate in voting or otherwise influence government. While the monopolies under study in the book thrive for decades, they all eventually die. Trounstine's chapter on the death of organizations is quite fascinating. Often, these organizations simply can't adapt to some new exogenous shock -- such as the Voting Rights Act or the Shakman rulings -- that make it harder to disenfranchise voters or to hire and fire city employees based on political allegiance. Sometimes, the very fact that these groups are so insulated from political opposition means that they don't see strong public resistance rising until it's too late. This is a rich book for party scholars, and would make for great discussion in a graduate level class on parties or local government. The book is certainly accessible for upper division undergrads, as well -- I plan to discuss some of it with my parties class next quarter. One problem with the turnout graph I posted earlier is that it uses the 2004 turnout rate as the baseline. Of course, some states had atypically high turnout that year because of hotly contested gubernatorial and senate races. So I've created the scatterplot below, which measures each state's turnout over the average turnout in the past three presidential elections. Once again, the biggest turnout spikes occurred in southern states. The trendline suggests that the biggest turnout increases came, unsurprisingly, in the battleground states. There's somewhat less of a turnout spike in the more liberal states and much less of a turnout spike in the more conservative states. 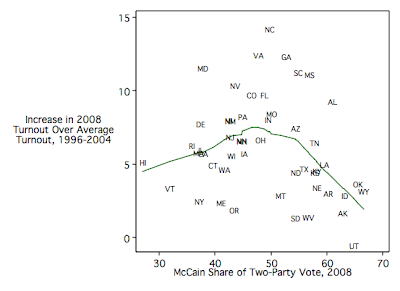 A regression analysis, incidentally, shows that the turnout increase correlates positively with the percent of the state that is African American and negatively with McCain's share of the vote. Both these variables are statistically significant at the .01 level. This strikes me as a mistake. If Salazar is chosen, then confirmed, it would scramble the political map in Colorado, leaving his seat to be filled through a special election, the date for which would be set by Gov. Bill Ritter. It also would assure Colorado, a swing state that helped propel Obama to victory, a seat at the new president's cabinet. Salazar's district -- which covers roughly half the state, from Grand Junction to Pueblo -- is a pretty conservative one. The same year that Salazar won that seat, Bush beat Kerry in that district 55-44. My feeling is that last month was the high water mark for the Democratic surge. From this point on, Democrats begin to be perceived as the party in power and start taking some heat for their decisions and the condition of the country. The odds of Dems holding onto Colorado's 3rd CD are pretty good if Salazar stays in office. They're considerably weaker in an open-seat special election. I'm surprised the party is considering this. Possibly one of the saddest moments during my adolescence was learning that the Batman TV series was actually a comedy. Voter turnout was the surprising disappointment this year. For all the talk about Obama's turnout machine, nationwide turnout was only up 1.5 points over the 2004 figures, according to Michael McDonald's estimates. Assuming those figures are close to accurate, here's how it looks at the state level, plotted against the state's vote for McCain: The states with the greatest turnout increases are almost all Southern states. This is consistent with some sort of race effect: high black mobilization combined with some sort of white backlash, possibly compounded by early voting (which took place in VA, NC, and GA). Also, Georgia and North Carolina had hot Senate contests. Interestingly, the non-Southern battleground states (e.g. : CO, MO, NV, PA, MN) didn't see much of turnout increase at all. Ohio is actually down from 2004. 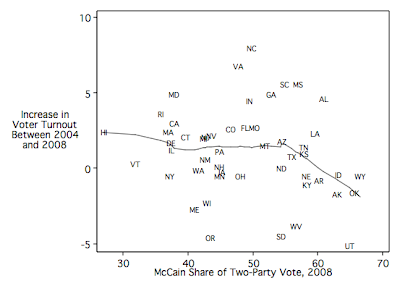 Also, note the ideology effect: there's a big dropoff in the turnout trend as you get above a 55% vote share for McCain. This suggests a depressed conservative base that failed to turn out. So Obama is nominating Bill Richardson to be Secretary of Commerce. Well, Richardson has a lot of cabinet experience, and this is good for the whole team of rivals motif, so, great! Of course, it would be helpful to know what a Secretary of Commerce does if we're going to evaluate Richardson's fitness for the job. True story: When I worked at the White House, I was in a quarrel with some relatives about what exactly room temperature was. I thought it was 72˚F, someone else thought it was 68˚F. So I figured, hey, I work for the federal government; I must have access to the truth here, right? So I browsed through the federal directory and found the Weights and Measures division of the National Institute of Standards and Technology, which is housed in the Department of Commerce. I put in a call to a scientist there and asked what room temperature was. He said that that was not his jurisdiction and suggested I call another scientist there who was "in charge of boiling point and freezing point." So I got that scientist, who told me that there was, in fact, no scientific measurement of room temperature. It's just a convention, usually ranging between 68 and 72. I love that there's a federal scientist in charge of boiling point and freezing point. You don't want to outsource that job. Anyway, that was my first ever interaction with the Department of Commerce. My other one has been to frequently download economic performance data from the Bureau of Economic Analysis. I greatly appreciate having access to these data, although I imagine the Department of the Treasury could provide this service just as well. I know Commerce handles trademarks and patents, which are a good thing. But again, could that be run by someone else? Labor? Treasury? For all the libertarian talk out there about eliminating such agencies as the Department of Education or the IRS, why does no one talk about Commerce?